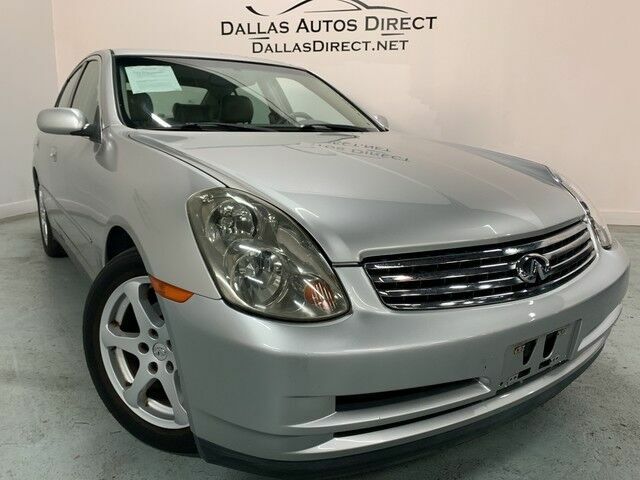 Dallas Autos Direct has a wide selection of exceptional pre-owned vehicles to choose from, including this 2004 INFINITI G35 Sedan. This vehicle is loaded with great features, plus it comes with the CARFAX BuyBack Guarantee. This is a well kept ONE-OWNER INFINITI G35 Sedan w/Leather with a full CARFAX history report. A INFINITI with as few miles as this one is a rare find. This G35 Sedan w/Leather was gently driven and it shows. This pre-owned INFINITI G35 Sedan looks like new with a clean interior that's been well-kept. Finance available with applicable fees.